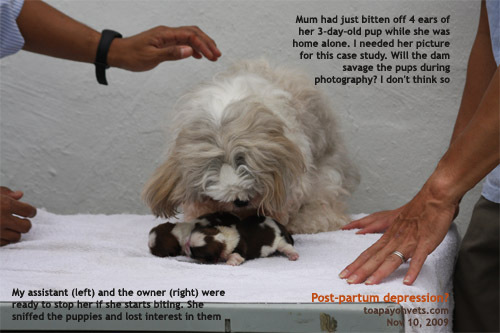 Will 3-day-old pups survive electro-surgery? 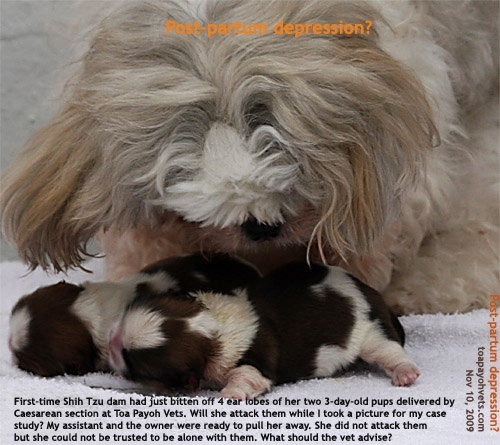 The home-alone first-time-mother Shih Tzu bit off the ear lobes of her 3-day-old pups. "She must have scratched off the ears," the male owner would not believe that mothers would bite progeny. "The male dog may be responsible." The pups had full rounded abdomen showing that they had suckled well. 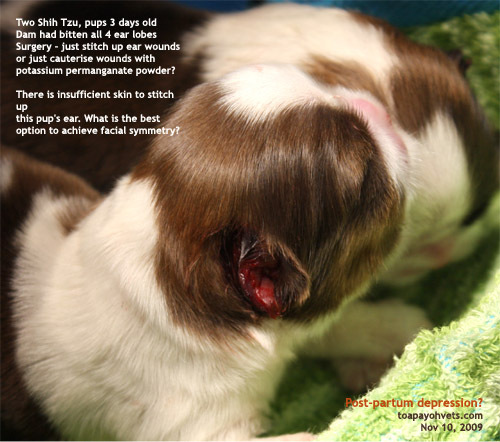 I showed him one puncture wound of 3 mm above the ear of one pup and one wound on the chin of the second pup. These wounds would heal. Four tattered ears in 2 pups. What should the vet do? The first thought would be to suture the skin and cover the ear cartilage. However the bite wounds were irregular in shape with more skin torn off in some parts of the ears and there would be insufficient skin to stitch up. This was my first time in over 3 decades of practice to encounter two 3-day-old pups being presented with bitten ears and were still alive. 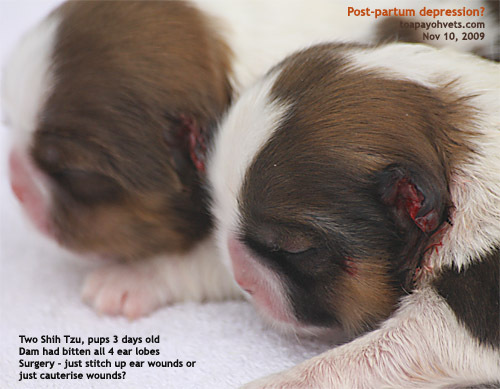 In most cases, the dam just killed the pups by biting their skulls, neck and abdomen. 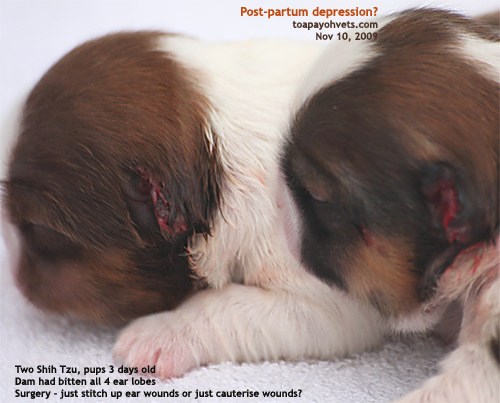 Lacerated ear wounds are usually treated by stitching. So, my assistant took out a rabbit anaesthestic mask to give isoflurane gas anaesthesia to the puppy after washing the ear area for surgery. He got out a small hair clipper which we use to clip the coat of hamsters. "Puppy anaesthesia is high risk," I said. "The rabbit mask is not suitable for flat-nosed 3-day-old puppy. Use the plastic container. Some vets use plastic bags to contain the gas. The dam was isolated. She was watched while she suckled her pups after 24 hours of my assistant hand-feeding the pups. The pups are then removed from her. Today is Day 5. The pups are OK and have had reduced their earlier puppy fat. *Stainless steel operating table conducted electricity. Therefore do not place your elbows onto the table. At one stage, my left elbow had an electric shock during electro-surgery as it touched the operating table inadvertently as I electro-incised one ear. 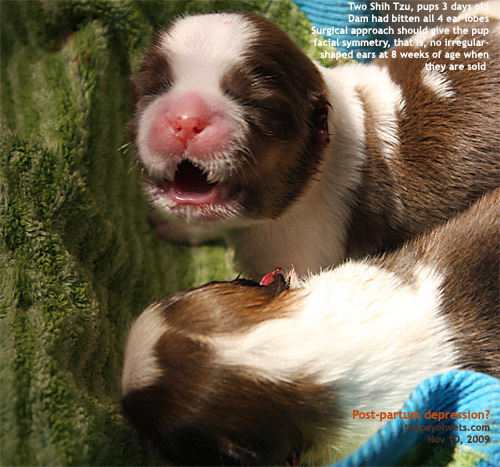 Electro-surgery is safe in 3-day-old Shih Tzu pups. The use of saline-moist gauze on top of the indifferent electrode helps to conduct electricity better. 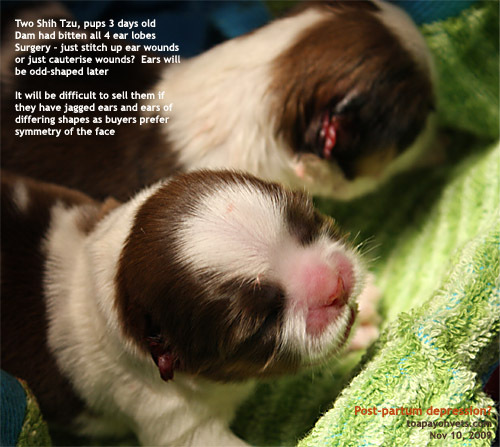 Always think of the future appearance of the pups when ears are torn as they may not find buyers if they look terribly abnormal. Prospective buyers may not want their friends to comment on their "abused" or "injured" dogs with jagged ears and therefore these pups may not find homes. 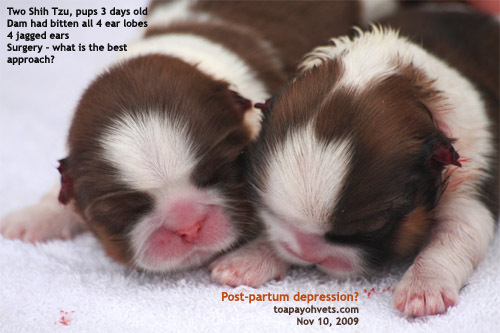 If the pups' ears are just treated with potassium permanganate powder and not given surgery, that would be bad for the pups' future as their ears will look irregular in shape and size as they grow up. Some may look shrunkened and withered. Referring to other vets who do electro-surgery may be in the interest of the pups.